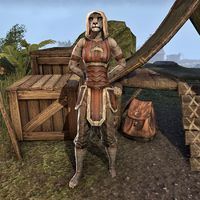 Haina-daro is a Khajiit chef who is found near the Temple of the Crescent Moons on Khenarthi's Roost. When you speak to her, she advertises her wares, "Exotic foods from the mainland! So fresh it's still damp!"